Safety procedures for ice and snow begin with understanding the weather report. The National Weather Service issues different types of storm warnings in their forecasts. If you understand the weather forecast, you can make plans for your home or when taking a trip. The following are the definitions put out by the National Weather Service for each level of storm. Winter weather advisory: Light winter winter is expected so exercise caution. Winter storm watch: Hazardous winter conditions, such as snow, sleet, or ice are expected, and travel may be affected. Winter storm warning: Significant winter weather with accumulation is expected and will cause significant impacts. Roads will be impassable and electricity may go out. Understanding your local weather report is critical. For example, if the National Weather Service has issued a winter storm warning in your area, it is important you prepare for the incoming storm. This means gathering flashlights and candles in case the electricity goes out and stocking the fridge and pantry with items like water and food. 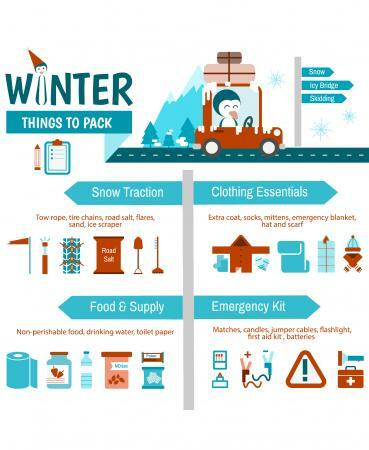 When you are traveling or live in an area that could potentially have ice and snow on the road, you need to be prepared. The first step when traveling is to check with the weather service for the area to learn the forecast. The second step is to have your vehicle checked by a mechanic to make sure all is in running condition, including good snow tires. If road travel is not advised, it is best to heed that warning. If traveling is okay, your vehicle should be well stocked to avoid disaster. Following are some essential items to have on hand in your trunk in case the weather turns foul. It's not uncommon for vehicles, even those with four-wheel drive, to slide off the road into a ditch or snowbank. 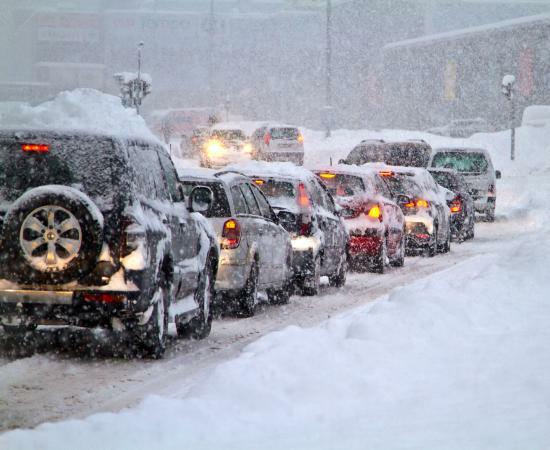 An automobile winter survival kit can help you or another motorist get out of an unfortunate situation. For example, a small shovel can be used to dig the snow out around your vehicle's wheels while sand can be used to improve traction while you try to maneuver your vehicle out of the ditch or snowbank. If that doesn't work, try using a tow chain or rope or call AAA or a tow truck. More than 6,000 people die every year from weather-related car crashes. It is important to remember to slow down as roads can be slick or covered in black ice. Sometimes people get stuck in snowbanks or on road during a storm. If that happens to you, stay in your vehicle as you can quickly become disoriented or hypothermic in the snow if you leave your vehicle. You can run your engine for about 10 minutes every hour for heat, but remember to crack the window to avoid carbon monoxide poisoning. Having winter storm kit in your car can save your life. Anything can happen during a winter storm. In January 1998, a massive ice storm hit northeastern US and Canada leaving millions of people across several states and provinces without power from days to weeks. Unfortunately, at least 35 people died during that storm. It's essential to be prepared during a storm. The following tips can mean life or death during a winter storm. Have your home heating system checked to ensure it is in working condition. 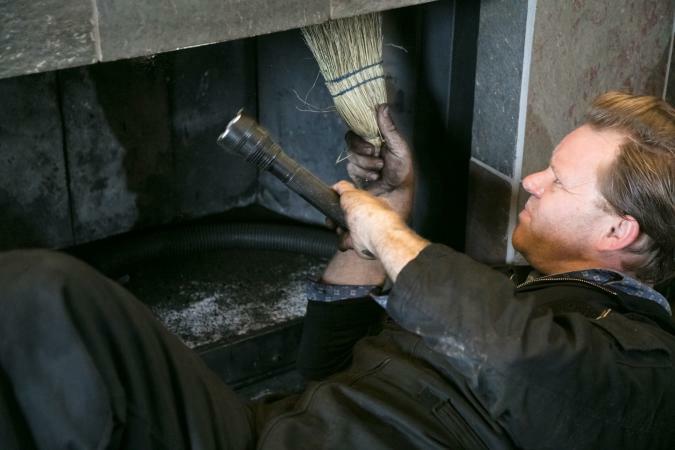 Have your fireplace and chimney cleaned and inspected annually. Make sure you have a working fire alarm and carbon monoxide detector. Protect your plumbing when temperatures go below freezing so your pipes won't rupture. Winter storms can deliver anything from multiple feet of snow to sleet and ice. In November 2014, parts of Western New York received up to 88 inches of snow closing the highways and towns down for days while people worked hard to dig out. While storms like these are rare, it is essential to be prepared for any winter storm. For example, if you live in an area where power outages are common, you will want to stock up on flashlights and candles. If your primary source of water is from a well, it is essential to stock up on drinking water as your water pump will not function without electricity. Living or traveling in the ice and snow can be a lot of work. Make sure both your house and your vehicle are prepared for the winter weather. From putting your snow tires on your car to stocking up on batteries, your preparations can be the difference between life or death. Don't let winter weather ruin your plans, but remember to be prepared for the worst.